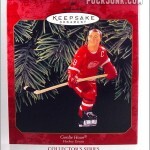 During the 1997 holiday season, Hallmark debuted its “Hockey Greats Series” of Christmas tree ornaments. Not surprisingly, The Great One himself, Wayne Gretzky, was the first player to be featured. 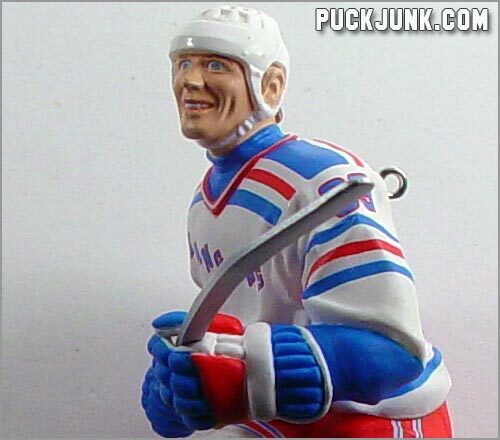 Measuring about 4 1/2″ inches tall, this handcrafted, well-detailed ornament has Gretzky decked out in his New York Rangers jersey. 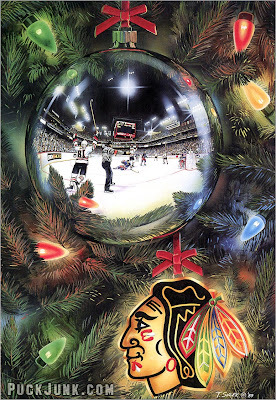 Also included was a special Upper Deck trading card that was only available with this ornament. The back of the box has a small photograph of the sculptor, Duane Unruh. The fine print reminds us that this ornament is “for decorative purposes only” and “not for young children”. This is by far the weakest aspect of this ornament. 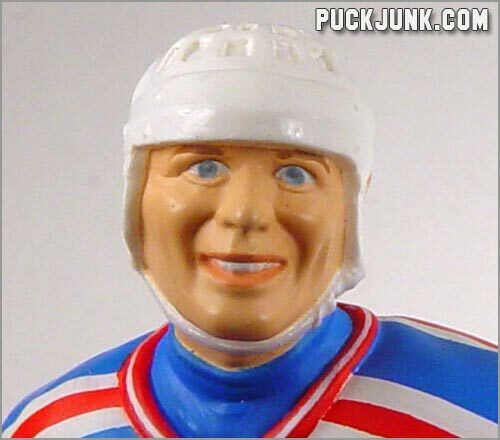 Between those big eyes and that wide, almost surreal smile, Gretzky looks less like a hockey player and more like an insane Campbell’s Soup Kid. 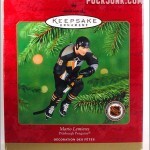 I know Gretz was a happy guy when he played, but he looks way too happy to be hanging from a Christmas tree. Stare into those big, blue eyes too long and you’ll either start to laugh or feel really uncomfortable. Go on, I dare you! 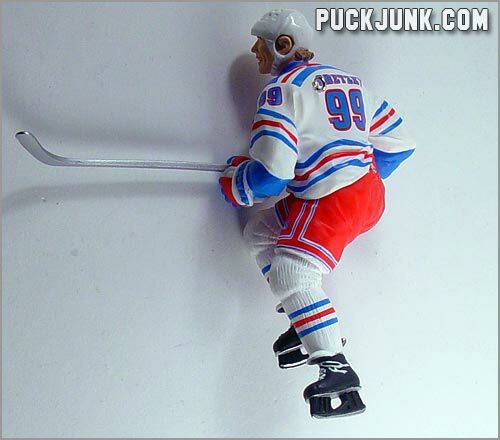 When you hang this ornament, Gretzky appears to be moving right. This pose, while dynamic, feels a bit awkward. He’s definitely going somewhere, I just can’t tell if he’s banking hard or falling down. Keep in mind that this ornament will not stand up on its own, so you’ll have to hang it from something. That’s a shame, as I think this (and the subsequent ornaments) would actually make a fine piece to display year round. 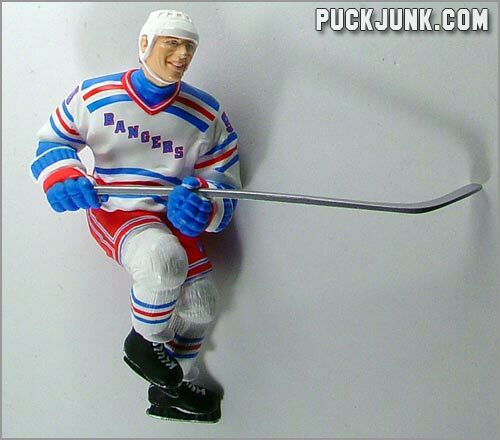 The detail on this holiday ornament is fantastic – especially when you compare it to any Starting Lineup Figure. Perhaps that’s a bit unfair, as SLU figures were intended for kids and sold for about half of what this ornament retailed for. While this was not marketed as a toy like SLU figures, it is roughly the same scale, so a comparison between the two seems natural. That said, every detail that you wanted to see on an SLU figure is here – numbers on the sleeves, proper striping on the jersey, even a small Rangers logo on the leg of the shorts. The personal details are replicated too, capturing Gretzky’s “style”, such as his Jofa helmet and the high-neck shirt under his jersey. 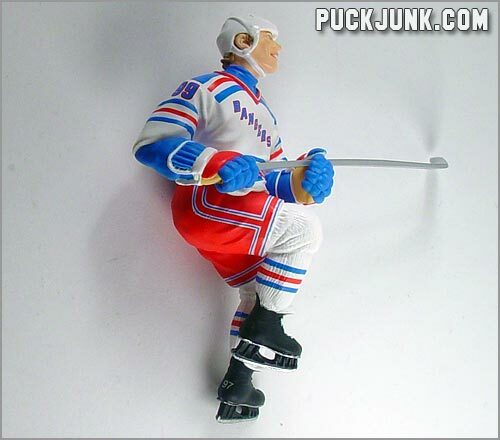 Of course, no Gretzky figure would be correct unless the jersey was “tucked in” on the right side – which is also replicated here. Other fine details are sculpted in too, such as the skate laces and the texture on the hockey socks. The details – both painted and sculpted – have been realized quite well. If only that face wasn’t so disturbing. One oversight is that Gretzky’s hockey stick has no detail on it – no brand logo, color or even hockey tape on the blade. The stick is just a plain shiny silver color, so obviously it’s an aluminum stick. But that is the only aspect of this ornament that lacks detail. I guess if Hallmark put “Easton” on the stick, then they’d have to pay royalties to that hockey stick company. But the lack of tape on the handle or blade makes the stick seem way too bare and bland. Maybe they could have put some tape on the blade, as well as “HALLMARK” in block letters down the shaft on the stick. That might have been cool. 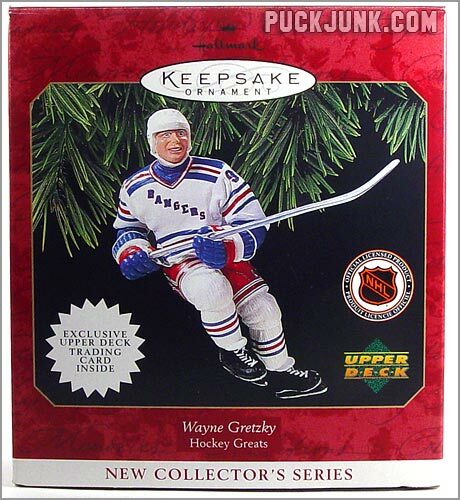 An Upper Deck trading card of Wayne Gretzky was included with the ornament. This is basically Gretzky’s 1996-97 Upper Deck hockey card with a different photo on the front. 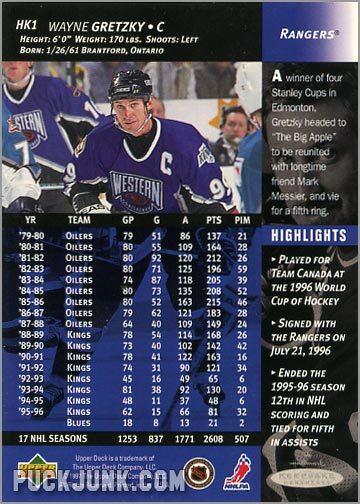 That particular card showed Gretzky and teammate Mark Messier. 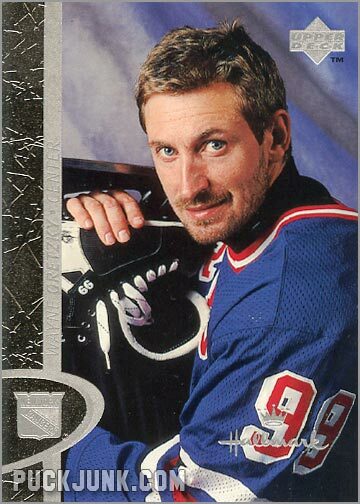 But this card shows a new, different photo of just Gretzky, smiling and holding a skate. The front of the card has the Hallmark logo in the lower right corner. At first glance, the back of the card is nearly identical to Gretzky’s 1996-97 Upper Deck card, but there are still several differences. The card number in the upper left corner was changed from 108 to HK1. 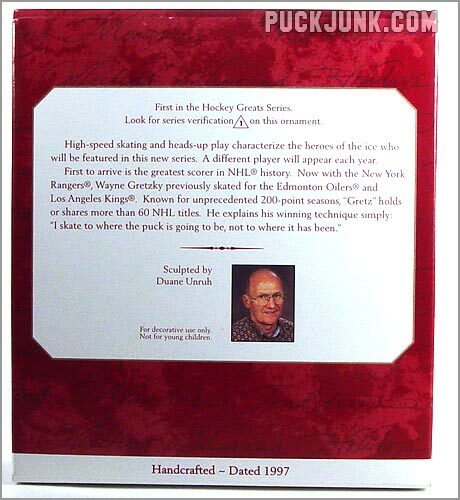 The ghosted photo on the right edge of the card is of just Gretzky (and not with Messier). Finally, a Hallmark Keepsakes Collection logo appears in the lower right hand corner in lieu of the Upper Deck hologram. A lot of people probably bought this ornament just for the card (OK, I’ll admit it…I’m guilty too). Had this card been the exact same card as the one found in the Upper Deck set, I would have felt a bit cheated. And while the back contains all the same information, at least the front of the card has an exclusive photograph. Oh, and let us not forget the shiny Hallmark logo too. 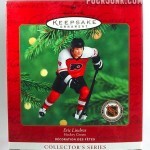 If you purchase this ornament online (since it’s long gone from stores), be sure to inquire about the card. Since these boxes weren’t taped shut, it was rather easy to slip the card out when no one was looking. (Not that I advocate this – note that I admitted to buying this in the previous paragraph). Also know that the card was not put in a sleeve or in any kind of protective plastic, so don’t be surprised if the card you get has dinged corners. Suffice to say, if the face on this ornament wasn’t so creepy, this would be a fantastic collectible item. Likeness aside, the sculpting and painted detail on this figure are on par with what McFarlane toys would do years later. Currently, this sells for no more than five dollars on eBay, brand new. I’m sure after Christmas you can find it for even less.